Bill is the Chair of Jackson & Campbell’s Trusts and Estates practice group and brings nearly 40 years of expertise to the field. Mr. Davis has been recognized as one of the top estate planning attorney and fiduciary litigators in the Washington, D.C. metropolitan area by Washingtonian magazine each year since 2005; voted one of The Best Lawyers in America by his peers every year since 2006; and selected as a Super Lawyer in Super Lawyers magazine annually since 2007. Bill is a member of Jackson & Campbell, P.C.’s Trusts and Estates and Professional Responsibility Practice Groups. 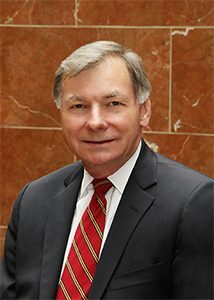 Prior to joining the Firm, Bill was a partner at a general civil practice law firm in Washington, D.C. and concentrated his practice is the area of trust and estate planning and administration and fiduciary litigation. He was elected in 2000 as a Fellow of the American College of Trust and Estate Counsel and is a member of the District of the Columbia State Committee. He has also been elected into the Fellowship of the Litigation Counsel of America. Bill is a member of the Estates, Trust and Probate Law and Taxation Sections of The District of Columbia Bar; the Washington, D.C. Estate Planning Council; the Advisory Committee on Probate and Fiduciary Rules of the Superior Court of the District of Columbia; the Counsellors; and the Barristers. He continues to remain active in The District of Columbia Bar following his service as treasurer and board member and co-chair of the Estates Trusts and Probate Law Section. He is currently a member of The Bar Association of the District of Columbia, following his roles as president and board member. Bill is a frequent lecturer on trust and estate planning and administration and an adjunct professor of trusts and estates at The George Washington University Law School. Previously, he served as an adjunct professor at The Catholic University of America Columbus Law School and Georgetown University Law School. He earned his J.D. from the Marshall Wythe School of Law, College of William & Mary and his A.B. degree from the University of North Carolina at Chapel Hill. He is admitted to practice in Maryland and Washington, D.C., and he is barred but inactive in North Carolina.